Alexander II Zabinas ruled the Greek Seleucid kingdom from 129-123 BC. Zabinas was a false Seleucid who claimed to be an adoptive son of Antiochus VII Sidetes, but in fact seems to have been the son of an Egyptian merchant named Protarchus. Antioch, Apamea, and several other cities, disgusted with the tyranny of Demetrius, acknowledged the authority of Alexander. 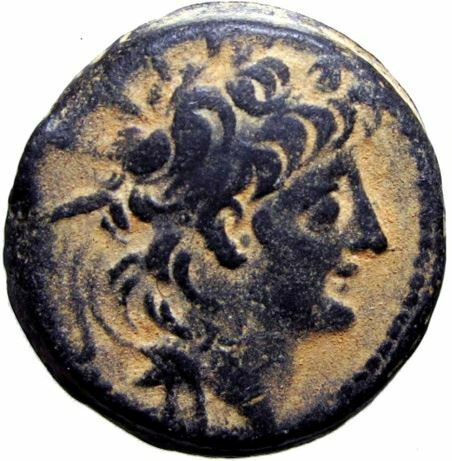 He was used as a pawn by the Egyptian king Ptolemy VIII Physcon against the legitimate Seleucid king Demetrius II, who supported his sister Cleopatra II against him. While Zabinas did defeat Demetrius II, he ran out of Egyptian support and was in turn defeated by Demetrius' son Antiochus VIII Grypus. Zabinas fled to the Seleucid capital Antiochia, where he plundered several temples. He was cast out of the city, and soon fell into the hands of robbers, who delivered him up to Antiochus, by whom he was put to death, in 122 BC.